Microsoft demonstrated its next Windows Operating System for the first time to developers yesterday on the West Coast. Dubbed surprisingly as Windows 10, rather than the expected Windows 9, the OS has several features to offer and tries to combine tradition with transformation in a single package. Windows 10 is Microsoft’s attempt to cover both the traditional aspects of Windows 7 and below and the modern UI interface of Windows 8 and above. Microsoft aims to deliver Windows 10 to the enterprise community as well, who shunned the radically changed interface of Windows 8. Windows 10 will be a cross platform operating system and will provide a single unified interface for its users. Microsoft has introduced several of the changes that were expected initially from Redmond for its next operating system. The public outcry that Microsoft faced after Windows 8 from Windows 7 users has made the company apparently re-think it’s strategy. To start, Windows 10 comes with a redesigned Start Menu. Following the best-of-both-worlds principle, Microsoft had decided to integrated the tiles in the Start Screen with the pop up format of the Start Menu. Given that the Start Menu was completely absent from Windows 7, that’s a huge gain for the popular feature. Two new options called Snap UI and Task View are new features on Windows 10 that are designed to assist in managing applications running on various desktops. The search option has gotten a new place on the taskbar. The Charms bar is staying as well. The Start Screen also remains but Microsoft says users will be able to switch between the feature based on touch or keyboard input. If you want to try out these features and more for yourself, then you’re in luck. 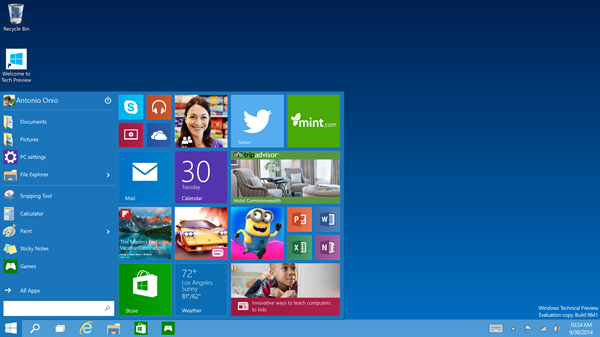 True to its word, Microsoft has made the Technical Preview of Windows 10 available for the general public. You can download the preview by clicking here. Let us know if you find anything that catches your eye!